Doom Patrol: Aw yeah, Doom Patrol! It's been way too long, my friends, but here I am. Where have I been? What have I been doing? I'll tell you. Later. First, some important news: with the September crazy line-wide relaunch, the Doom Patrol is back! Sort of. It’s the issue of doom! Join the Tiny Titans as they – walk to school! 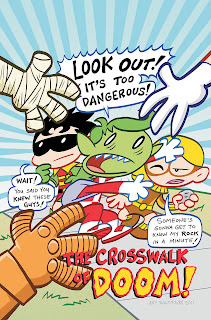 Beast Boy takes a wrong turn when confronted by the crossing guards he calls The Doom Patrol. 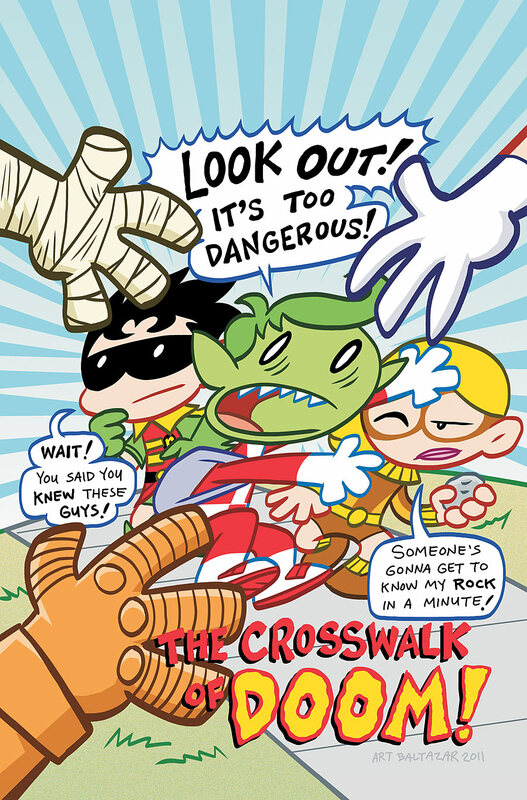 Plus, witness Beast Boy’s first encounter with the Crossing Patrol Boys of Doom! Crossing the street has never been so tough! Welcome back! I'll have to check, but you might have broken my record for dormancy. Good eye on the Tiny Titans; looks like it might be cameos and trades for a little while. Hope everything's been OK. Cool! I'm happy to see the DP anywhere. Hahah! 'Someone's going to get to know my rock in a minute' has to be one of the best lines ever.